Posted Thursday, March 6th, 2014 by Greg Gladman. The gowns, the speeches, the crazy hosting of Ellen DeGeneres. There was so much to love this year. But the thing that topped our list was appreciation. No one at the Oscars could have gotten where they were without numerous other people who weren’t invited to the ceremony: the family members who supported and encouraged them, their fellow cast members, the numerous people in the movie industry working hard to make them look good, and the adoring fans who watched their movies throughout the years. Our gregarious hostess shattered Twitter’s retweet record of 780,000 in less than 34 minutes, and was also the first user to surpass 1 million retweets for a single Twitter post. 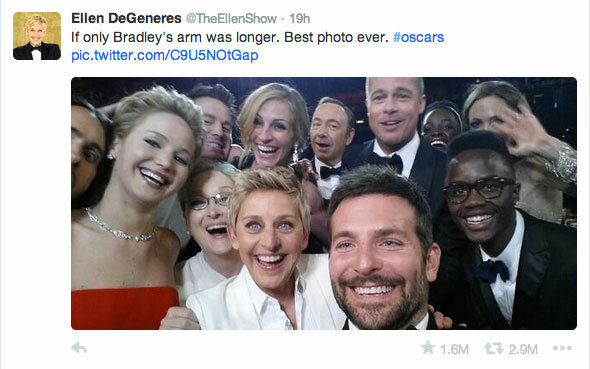 But all Ellen did was snap a picture. It was up to the millions of people watching from home to break the record for her. We here at Ink Technologies owe everything to our loyal customers. In the spirit of the Oscars, we’d like to share our appreciation. We wouldn’t be where we are today without you!